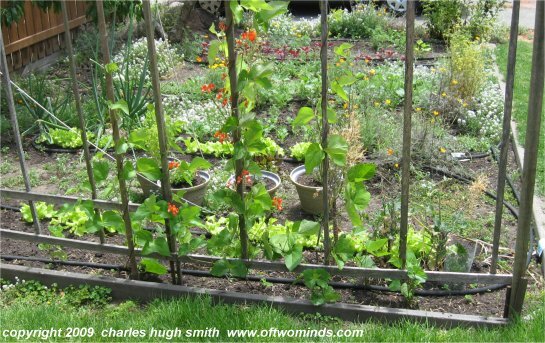 From a micro-garden to the West's water rights. 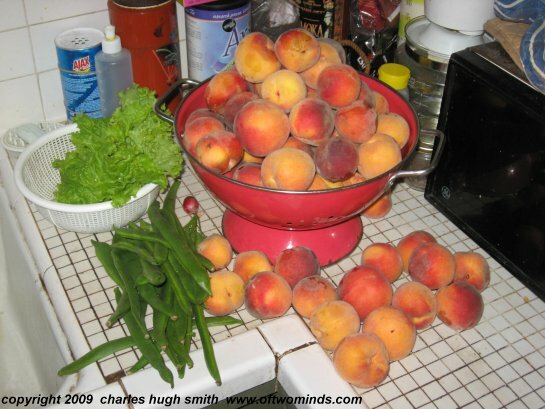 Here are three photos: our little urban micro-garden, our peach tree and a cornucopia "harvest" of a few minutes work. I was inspired to post these photos (taken a few weeks ago) because I was thrilled (yes, thrilled) to see a number of honey bees flitting between the California poppies in our garden yesterday. As you can see, I am lazy gardener. Things look messy here, but here's the list of stuff growing in this little plot of earth: peach tree, cilantro, parsley, basil, strawberries, malabar spinach, amaranth, cucumbers, zucchini, scarlet runner beans, lettuce, baby bok choi, tomato, mums, onion and Russian kale. As many of you know, bees have suffered devastating declines in most regions of the nation due to mysterious causes--causes which appear to be negatively synergistic interactions of mites and environmental stresses. In this urban micro-climate of the San Francisco Bay Area, honey bees and bumble bees, once common in our lush poppy plantings, essentially vanished for years. I was encouraged last year to note a few bumblebees had come back, but this year is the first time I've seen honey bees in a long time. I make a concerted effort to keep flowers blooming all year (yes, I know those of you in snow zones cannot do this) and especially now, in late summer when most flowering plants have faded (at least here in the semi-arid West). I purposefully allow a new crop of poppies to sprout amidst the vegetables during summer, and I also let some vegetables go to seed to give the pollinators something to collect. Right now our small garden has the following blossoms: poppies, onion, bok choi, alyssum, cucumbers, zucchini, tomatoes and mums. The bees, wasps, moths, aphids and the rest of the insect crew each favor certain flowers; the honey bees are keen on the bright-golden poppies, and it's endlessly amusing (OK, I'm a gardener, and thus easily amused) to watch a pollen-loaded bee nestle into a poppy flower, which bends under the heavy weight, only to spring lazily sunward once the bee lifts off. The genetic programming of bees is visible in the way they cover every blossom in a seemingly random fashion; each takes some pollen but leaves some for later collectors. Small insects I would not normally even notice are partial to the big round onion blossoms, while even tinier critters are grazing over the small alyssum flowers. There are still a few hardy poppies around the rest of the yard, plus a variety of other late flowering ornamentals. Although I can't see in the infra-red part of the spectrum like insects, I reckon our little urban garden (the only one for blocks) must light up like a Christmas tree to a wandering pollinator. 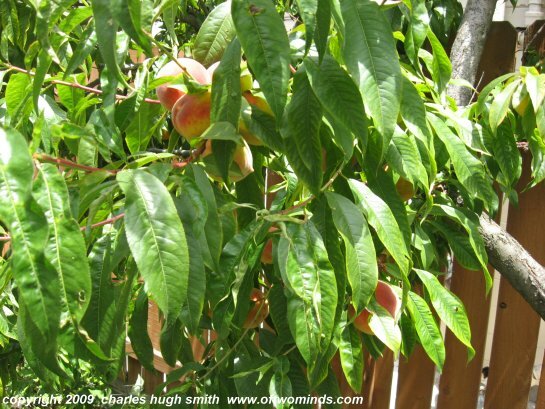 Our peach tree and lemon tree are always loaded with fruit, and I ascribe this abundance partly to the pollinators which stop by our little oasis; every blossom gets visited by some little creature, be it night-time moth or daytime bee. I am not currently residing there, but I am from Utah. I read with some interest today that Utah had irrigation on crops and therefore is "drought proof". NOT TRUE!! Irrigation is using the water out of rivers and streams, diverting it according to a strict metering system (through a measuring device called a partial flume) down ditches to fields. This water is usually the result of melting snow runoff, and is fully subject to droughts. First all of the water in any given river (take Buzzard Creek in Western Colorado's Plateau Valley near the town of Collbran about forty miles east of Grand Junction) is already spoken for. For instance the water in Buzzard Creek (prior to emptying into Plateau Creek, then the Colorado River) has owners; there are five ditch "companies" along Buzzard Creek, each ditch supplies water to between one and seven ranches along the 20 or so miles of creek that runs through private land (as opposed to National Forest or BLM). Each of these ranches or ranch parts has a pre-determined amout of claim to a PERCENTAGE OF THE WATER FLOWING BY. So if the creek is running 1,000 cubic feet per second (a true hundered year flood by Buzzard Creek standards) and Ranches A, B, and C share a ditch at the top of the water chain, there is a state water inspector who comes in and regulates the flow of water into the ditch through a headgate. He opens that gate and allows say 8 cubic feet per second into the ditch, allowing the rest of the water to remain in the creek and flow down to the ranches, cities, and towns that have claim to a share of water in the creek. The water inspector must insure that no one party takes out more than their allotted share (the rights to water go in order of date the claim was made, so a newer ranch, defined as new fields, or arable land--not the sale of existing land and water rights to a new owner--will be bypassed during times of drought in favor of established claims to the water based on the order received. Ranches are not the only ones with rights to the water in Buzzard Creek. There are farms and ranches off of Plateau Creek, and the Colorado River who have claim on water in Buzzard since it will flow into those respective Creeks and Rivers. Then there are Cities. The Cities of Palisade, Grand Junction, and Fruita, Colorado, Moab, Utah, and Los Angeles, CA, all have claim to some of the water flowing down Buzzard Creek, Colorado. Some of these claims are very old, and trump the rights of the oldest of ranches. Even the Twentynine Palms Marine Camp in California has claim to some of the waters, and during "war time" (its always war time now) the military rights trump all. Ironically there are no Mexican Towns or farms mentioned in the Colorado water distribution claims. The Area in Western Colorado and Utah is very dry, and not much would grow without the irrigation systems in place. The thing is that much like Peak oil, in the west, as climate changes take place, there could very well be periods of extreme drought, with the rights of people in L.A. to wash cars trumping the right of a rancher in Collbran to water his alfalfa. If Goldman is expanding into Utah, look to natural gas for the reason, because Utah, like so many other places, has given its best farmland up in favor of planned communities and Wal Marts. Thank you, Nels, for an excellent explanation of how water rights work in the West. I had my own brief education while researching an article on agricultural ponds in Napa Valley a few years ago: Bel Paesaggio: California Vineyard Landscapes (May 2005) San Francisco Chronicle Magazine. Here in California, if rainwater collects in a rivulet and flows on the surface while it rains it is a "seasonal stream" and you can't collect it. So you need to place your collection pond away from any rivulets or gulches. I will cover rainwater collection at home in more depth tomorrow--readers submitted much practical advice which I will share. Thank you, Richard F. ($10), for your most generous donation from the U.K. to this site. I am greatly honored by your support and readership. Thank you, Stephen N. ($50), for your outrageously generous donation of a gift card to this site. I am greatly honored by your support and readership.